Emil Carlsen was a prominent academic still-life painter, admired for his contemplative depictions of flowers, dead game and kitchen objects. He also painted portraits, figures and marines, as well as poetic landscapes that earned him a place in the tradition of Impressionist painting in Connecticut. Whatever his subject or style, Carlsen imbued his work with a sense of tranquillity and repose-qualities that contributed to his popularity among critics, collectors and his peers. Carlsen studied architecture at the Royal Academy in his native Copenhagen during the late 1860s. Born into a family that included several marine artists, he painted and sketched during his spare time and is said to have recieved art lessons from a cousin, Carl Blache, before immigrating to America in 1872. Settling in Chicago, Carlsen worked for a local architect and taught mechanical drawing. He was later hired as a studio assistant to Lauritz Bernhard Holst, a Danish-born marine painter. When Holst returned to Denmark in 1874, Carlsen took over his studio and began painting full-time. In 1875, Carlsen made a six-month trip to Europe. His visit to Paris afforded his the opportunity to study the work of the eighteenth-century French still-life painter Jean-Baptiste-Simeon Chardin, whose finely crafted depictions of humble, everyday objects exerted a major influence on his art. He then resided briefly in New York before going to Boston, where he augmented his income by working as a designer and engraver. In 1879, Carlsen went back to Chicago. By the early 1880s, he was attracting notice for his still lifes characterized by simple yet elegant compositions, expert draftsmanship and a concern for rendering textures, space and light. In 1884, Carlsen returned to Paris, painting still lifes for the New York art dealer T. J. Blakesee ad studying at the Academie Julian. He also lightened his palette to French Impressionism and painted his earliest landscapes in the rural countryside. Tiring of the repetitive nature of his commissioned still lifes, Carlsen broke his contract with Blakesee in 1886. One year later he moved to California to become director of the San Francisco School of Art. He remained in that position until 1889, after which he taught privately and at the recently established Art Students League. However, seeking a more stimulating artistic climate and greater opportunities for sales and exhibitions, Carlsen returned to New York in 1891. Thereafter, he fraternized with a cadre of leading American Impressionists that included Childe Hassam and J. Alden Weir. After 1896, he began making trips to Connecticut, going on to acquire a summer home in Falls Village in 1905. Although he continued to paint still lifes, the landscapes of New England and upstate New York became the subject of many of his paintings. Carlsen also painted seascapes in Maine and Denmark. Carlsen began summering in Connecticut during the mid-1890s, visiting his friend and fellow artists J. Alden Weir in Windham Center. During these excursions, the two men painted together, depicting local scenery. Carlsen became increasingly committed to landscape themes after 1905, when he established a residence in Falls Village. Thereafter, he painted views of the surrounding countryside while continuing his activity as a still life and marine painter. Carlsen’s move towards a decorative manner of painting may have been influenced by the example of Weir, who employed a similar approach in his works such as In the Sun (1899: Brigham Young University, Provost, Utah). In Foothills, this tendency is revealed in the artist’s use of a reductive composition featuring a limited palette of closely related hues and subdued luminosity. The heavily encrusted paint surface, along with the simplified, two-dimensional forms, help create a tapestry-like effect, while the evenly toned pastel colors contribute to the mood of quiet harmony that pervades the image. 1. “Necrology,” NAC Bulletin 13, (February 1932): I2), For Carlsen, see also F[rederic] Newlin Price, “Emil Carlsen: Painter, Teacher,” International Studio, 75 July 1902: 300-308; BG Minutes, 30 April 1913: EC Minutes, 10 July 1913: AM Minutes, 14 April 1914, Duncan Phillips, “Emil Carlsen,” International Studio 61 (June 1917); cv-cx, Eliot Clark, “Emil Carlsen,” Scribner’s Magazine 66 (December 1919): 767-70: Albert van Sand, “Two Danish-American Painters,” Scandinavia 1 (February 1924), 47-50, John Steele, “The Lyracism of Emil Carlsen,” International Studio 88 (October 1927): 53-60: Gene Hailey, ed., California Art Research 4 (San Francisco; WPA Project 2874, 1937), 27-63: The art of Emil Carlsen, 1853-1932. exh. cat. (San Francisco: Wortsman Rowe Galleries, 1975); Dorothy Tananbaum, The Art of Emil Carlsen, 1853-1932, exh. cat. (New York; Hammer Galleries, 1927), Gertrude Sill, “Emil Carlsen: Lyrical Impressionist,” Art and Antiques 3 (March-April 1980), 83-95: Jeffery Stewart, “Soren Emil Carlsen (1853-1932)” in Ruth Lilly Westphal Publishing, 1986), 52-57, 195: Ulrich W. Hiesinger, Quiet Magic: The Still-Life Paintings of Emi lCarlsen, exh. cat. New York, Vance Jordan Fine Art, 1999). 2. Steele, “The Lyracism of Emi lCarlsen,” 37. 3. 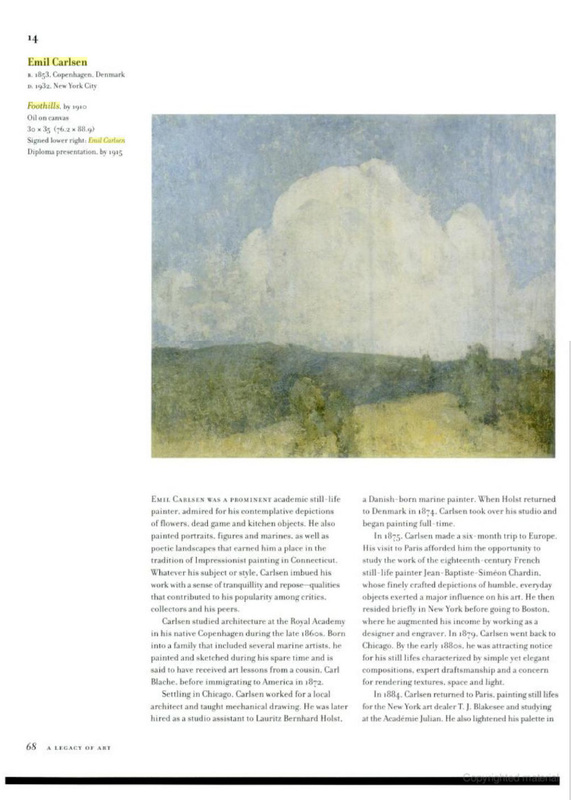 See William H. Gerdts, “Post-Impressionist Landscape Painting in America,” Art and ANtiques 7 (July-August 1983(, 64. 4. 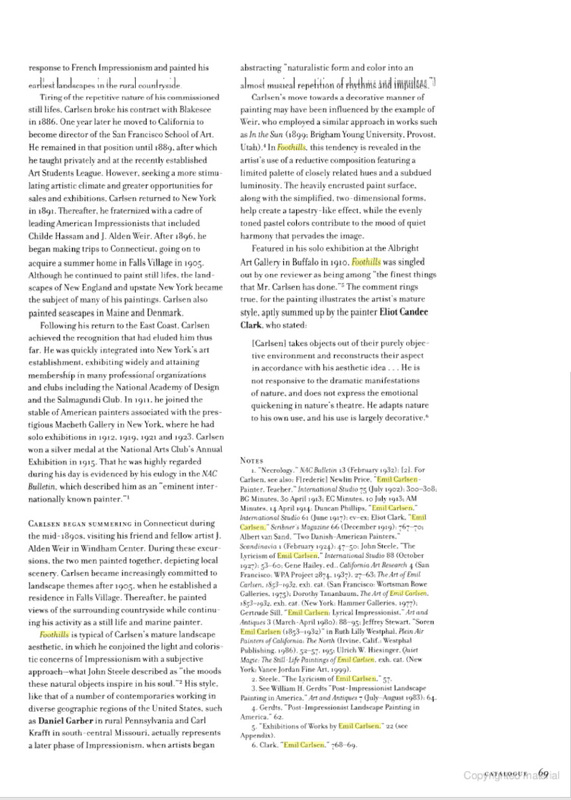 Gerdts, “Post-Impressionist Landscape Painting in America,” 62. 5. “Exhibition of Works by Emil Carlsen,” 22 (see Appendix). 6. Clark, “Emil Carlsen,” 768-69.